Bridge mode allows the network to one affiliated with the network on the other transparently, without the need to go through routing, so the engine is in the network that one can have IP addresses that are in a same subnet as the other side. 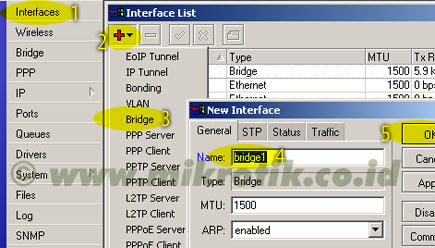 However, if our wireless network is quite large, this will create a bridge mode wireless traffic increases, since there will be a lot of broadcast traffic from one network to another network. For a network that is large enough, I suggest the use of routing mode. Here is a diagram of the network that we will set. 4. Next is a wireless interface settings. Click on the Wireless menu (1), choose the tab interface (2) and then double click on the wireless interface name that will be used (3). 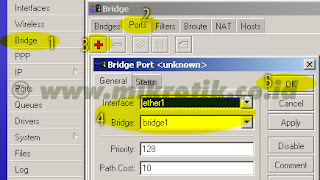 Select AP-bridge mode (4), find ssid (5), the band 2.4GHz-B / G (6), and the frequency to be used (7). Do not forget to activate the default authenticated (8) and the default forward (9). 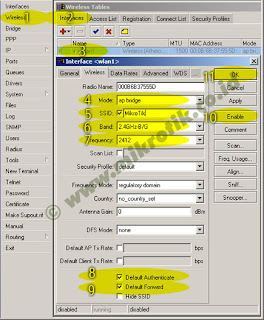 Then aktifkankanlah wireless interface (10) and click OK (11). 5. 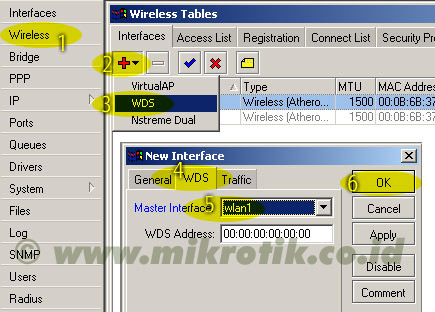 Next is the configuration of the WDS on the wireless interface is used. 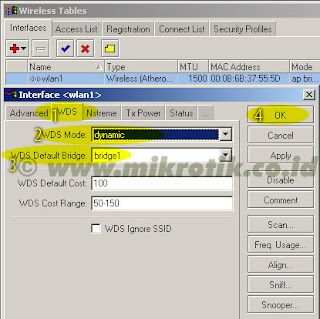 Open back wireless configuration as the above steps, choose the tab WDS (1). 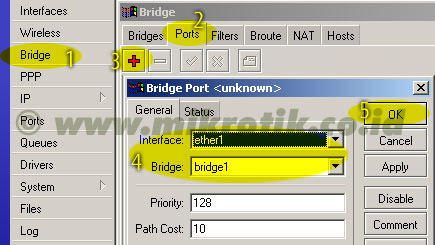 Determine the dynamic WDS Mode (2) and choose a WDS bridge interfaces for this (3). Then press the OK button. 6. The next step is to add a virtual interface is WDS. 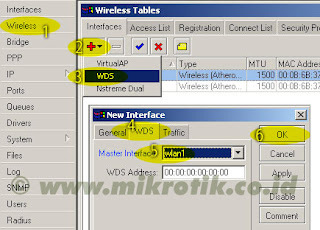 Add new WDS interface as in the picture, then choose the wireless interface we use for this WDS. Then press OK.
7. If the WDS has been added, then the new WDS interface will look like in the picture below. Configuring the wireless station is almost the same as the steps above, except the step to enter the IP address and configuration wirelessnya. In the station configuration, the mode is station-WDS, frequency need not be specified, but must determine the scan-list in which the frequency of the access point included in the scan list. For example the access point we determine the frequency of 2412, the write scan-list 2400-2500. If we make the wireless link is working properly, then the wireless menu, will show the status of R (see figure below). 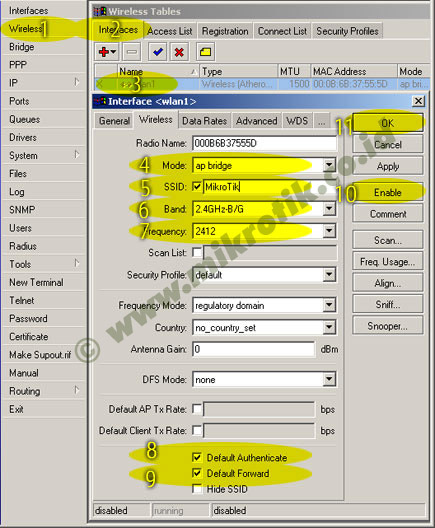 In addition, mac-address from the wireless-connected can also be seen in the registration window (see picture below). In Mikrotik, easiest way to maintain the security of the network is to register the mac-address pair in the wireless access list. This must be done on the access point or on the client side. If penginputan access-list has been done, then turn off the default authenticated on the wireless feature, then the other wireless mac addresses not listed will not be able to connect to our network. If we want better security features, we can also use either WEP or WPA encryption.